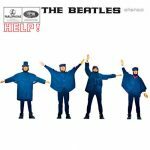 El álbum Help! fue lanzado en Inglaterra como Parlophone PMC 1255 (mono) y PCS 3071 (estereo). Lado “A”: “Help!”, “The Night Before”, “You’ve Got To Hide Your Love Away”, “I Need You”, “Another Girl”, “You’re Going To Lose That Girl”, “Ticket To Ride”. Lado “B”: “Act Naturally”, “It’s Only Love”, “You Like Me To Much”, “Tell Me What You See”, “I’ve Just Seen A Face”, “Yesterday”, “Dizzy Miss Lizzy”.